Are you ready to explore an area that is experiencing exciting growth. Not only is the Charlotte area home to many corporations and businesses, you will find some astrounding attractions to take in. Whether you love sports, amusement parks, museums, music or theater, this is the place that you want to be. You and your group will find yourselves within minutes of anything that you love to do and see. Having so much available to you, the key to having an exceptional experience is the mode of transporation you end up choosing. We have a suggestion for you. Why not go for broke and enjoy a transportation service that won't just get you to where you want to go but will enhance your plans. We promise you that our very special vehicles will have you not only riding in style but having an absolute blast at the same time. Ready to ride around North Carolina in premium style? You’ve come to exactly the right place! Whether it’s the rolling green mountains, beautiful weather or happening night life that brought you here, we have the top of the line vehicles to cart you around. You’ll love the close proximity to Mother Nature while staying close to the city, and you are sure to have an unforgettable time in Charlotte. And you can count on us to deliver world class customer service in every way. If you want to feel like a king and queen out for the inaugral ball, then we can certainly fit the bill and make it happen. And just think about the types of things that you want to avoid when you are looking to travel around town and see the sights. Trying to have you and your group carpool is never fun. Think about it, everyone will be separated for much of the time and then you have to worry about all of the various cars finding parking spots and and then having the group meet back up at each destination. Not to mention that by carpooling, you will be leaving out a number of people from your group in terms of having a few drinks. The last thing that you want to do is to put someone in your group at risk. But by renting one of our fabulous vehicles, you can put all of those worries to rest as your entire group will be relaxing and having a blast together for the entire time. Charlotte Limousines is the premiere limousine and party bus rental service in the entire Charlotte area. You won’t find a company with higher standards at more affordable prices, guaranteed. It doesn’t matter if you need transportation for your big wedding day or you just want to enjoy all the best nightclubs and bars in the area, we have Charlotte Limo and Charlotte Party Bus options and vehicles to please everybody. And one thing you will always be able to count on in terms of our vehicles is top notch quality in every way. 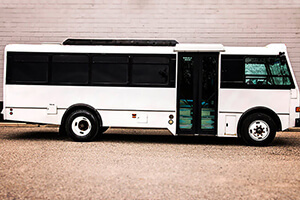 The mechanical portion of our buses and limousines are consistently maintained by certified mechanics. The interior is attended to by professional detailers who do a phenomenal job making everything look like brand new. And our chauffeurs are not only certified but they are all very experienced and know the area roads like the back of their hands. And we haven't even talked much about the unbelieveable features and amenities that you and your friends and family are going to be able to play with as you safely travel from destination from destination. In the end, our customer service professionals make our business what it is. 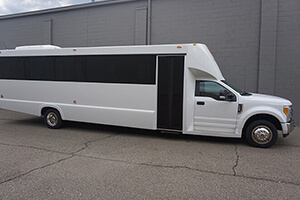 They know the limousine and party bus rental business from front to back and it shows through their wonderful attitudes and extensive knowledge about anything that has to do with our business. If you have any questions, don’t hesitate to call or email us at any time. We love to hear from you and answer any questions you might have. And one thing you will never find is one of our representatives pressuring you to make any kind of decision. We will be as patient as you need us to be. If all you want to do is call us five times and talk about our business, then we will be more than happy to do so. You won’t find a better customer service experience anywhere else. Our agents are experts not only at answering questions but also at fitting groups to the perfect vehicle for their exact needs. It won't take you long to realize that leaving all of the details to our fine staff is the way to go. We look forward to your call and to servicing your next exciting event. Charlotte Limousines has been the leading limousine and party bus rental service in the Charlotte area for almost a decade. Not only is our business mainly luxury limousine and party bus rentals, most of our business has to do with our amazing customer service. Copyright © 2017 | www.CharlotteLimousine.net | All Rights Reserved.